A more complete set of data revealed that growth edged up in Sub-Saharan Africa’s (SSA) economy in the final quarter of 2017, as the region’s gradual recovery continued. Regional GDP increased 3.2% annually in Q4, above last month’s preliminary estimate of a 3.0% expansion and Q3’s 3.0% increase. The reading marked the fastest growth rate since Q3 2015 as higher commodity prices, solid global growth and healthier harvests boosted activity. For 2017 as a whole, the SSA economy grew 2.8%, notably above 2016’s 1.8%. Ghana was the region’s star performer in the fourth quarter, expanding a buoyant 8.1% in annual terms. Surging activity in the energy sector and a strong agricultural sector fueled the upbeat reading. Meanwhile, Botswana’s economy accelerated notably in Q4, following a lackluster performance in the first three quarters of the year, and rising copper prices spurred faster growth in Zambia. Regarding the region’s major players, growth gained steam in both Nigeria and South Africa. While the macroeconomic picture in the region is clearly improving after a commodity price-induced slowdown in 2015–2016, several challenges linger. Most of the economies in the region remain poorly diversified and lack infrastructure, and the region’s business environment is challenging overall. These issues need to be tackled by policymakers, but progress has been mixed in recent weeks. Angola, Ethiopia and South Africa have all taken steps in the right direction, although it remains to be seen if their corrective actions will be successful. On 17 April, Angola officially requested non-financial assistance from the IMF as authorities try to attract FDI inflows and diversify away from the battered energy sector. President João Lourenço has vowed to turn the economy around and correct imbalances, but it is uncertain if the political willpower for tough reforms will hold. In Ethiopia, a new prime minister was sworn in at the start of April to cool simmering political and ethnic tensions and open the way for reforms. Mass unrest has interfered with policymaking in recent months, and a political shuffle could help. Meanwhile, the political transition in South Africa, which saw Cyril Ramaphosa take power, has sparked optimism over the country’s reform momentum. Ramaphosa has appointed respected ministers to key roles, taken steps towards improving the government’s finances and is focused on turning around struggling state companies. However, the ruling party remains deeply divided, which could complicate policy efforts; bolder reforms are needed to fix the economy. Conversely, authorities in Nigeria have still not passed the 2018 budget, delaying an expected boost to government infrastructure spending. The record NGN 8.6 trillion (approximately USD 28.2 billion) budget was first presented in November; however, delays over ministries coming before parliament to defend their allocations has delayed its implementation. 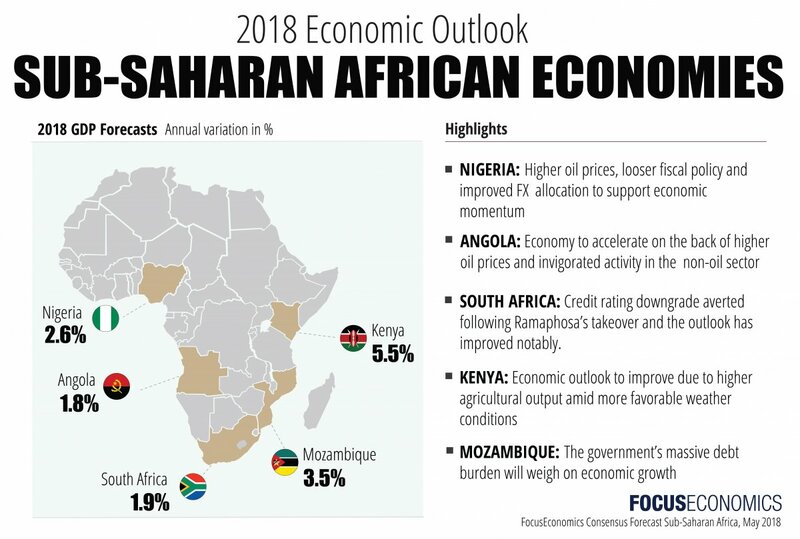 Growth in Sub-Saharan Africa’s economy is projected to gain momentum this year thanks to firmer commodity prices, a healthy global economy and recoveries in the region’s major players, Nigeria and South Africa. FocusEconomics panelists see regional GDP expanding 3.5% in 2018, up a notch from last month’s forecast. While the economic panorama is improving, several weak spots remain, including high debt loads and large imbalances, which could threaten the region’s outlook. Next year, growth is seen accelerating to 3.7%. This month’s raised outlook for the region was driven by upward revisions for the bulk of SSA economies. Eight economies saw their prospects upgraded, including Angola, Kenya and South Africa. However, Botswana, Mozambique and Zambia all saw their outlooks downgraded. Meanwhile, Nigeria and Tanzania saw no changes to their forecasts. Ethiopia is expected to be the best performer in SSA this year, with 7.9% growth, followed by Ghana (7.3%) and Côte d’Ivoire (7.1%). On the other hand, the region’s major players are expected to be the slowest growing economies. Angola’s economy is seen growing 1.8%, South Africa is seen expanding 1.9% and Nigeria’s GDP is projected to increase 2.6%. The economy ended 2017 on a firmer note, with growth picking up to a two-year high. Activity is expected to have continued gaining steam in the first quarter of 2018, supported by higher oil prices and greater foreign exchange rate supply. Accordingly, recent economic data has pointed up, and the PMI rose to a record high in March. However, authorities have still not passed the 2018 budget, delaying its implementation and an expected boost in government spending. In the political arena, President Muhammadu Buhari stated on 9 April that he would seek his party’s nomination for the upcoming 2019 elections. The announcement sparked a negative market reaction, with stocks falling slightly. Buhari is 75 years old, and there are concerns over the state of his health. FocusEconomics panelists expect GDP growth to accelerate in 2018 and clock in at 2.6%, which is unchanged from last month’s forecast. Higher oil prices, looser fiscal policy and improved FX allocation should support the economy’s momentum this year. That said, several challenges to growth still linger including exchange rate distortions, poor infrastructure and likely political tensions ahead of the February 2019 general elections. Next year, growth is seen increasing mildly to 3.1%. On 23 March, Moody’s confirmed South Africa’s BBB rating and upgraded its outlook from negative to stable. The highly anticipated decision averted a credit downgrade to sub-investment grade, which would have put considerable pressure on the country’s high debt burden. The critical assurance that a credit rating is no longer imminent paves the way for a sustained recovery in business and consumer confidence, giving Cyril Ramaphosa’s administration room to implement market-friendly policies to bring investment into an economy that is slowly gaining traction. In February, manufacturing output expanded for the fifth consecutive month, and growth in retail sales accelerated in part due to a stronger currency. The manufacturing PMI remained positive in March, expanding for the second straight month following a string of uninterrupted contractions since August 2017. The country’s economic outlook has improved notably since Cyril Ramaphosa was sworn in as president in February and a credit rating downgrade by Moody’s was averted. Nevertheless, the implementation of economic reforms is necessary to foster faster growth and sustain the ongoing recovery. FocusEconomics panelists expect the economy to grow 1.9% in 2018, which is up 0.2 percentage points from last month’s forecast, and 2.0% in 2019. The most recent data confirms that economic conditions remain challenging, despite a rebound in GDP growth last year and ongoing reform efforts to increase competitiveness. Industrial production in 2017 contracted, and economic sentiment in the fourth quarter of 2017 remained deeply entrenched in negative territory, although it ticked up slightly. Public spending is expected to be cut significantly this year as the government attempts to put the fiscal account on a more sustainable footing to lower the elevated public debt. On 17 April, authorities officially requested non-financial assistance from the IMF. They hope that the Fund will help Angola decrease its overreliance on the oil industry by supporting growth in the non-oil sector. GDP growth is expected to accelerate from 2017’s soft print this year on the back of higher oil prices and invigorated economic activity in the non-oil sector, partly due to improved liquidity of foreign currency. FocusEconomics panelists expect GDP to expand 1.8% in 2018, which is up 0.2 percentage points from last month’s forecast. For 2019, growth is expected to reach 2.2%. Recent data signals the economy gained significant ground in the first quarter. Growth was impeded last year by a devastating drought that dealt a heavy blow to agricultural output, and disruptions stemming from a protracted election period in the second half of the year. The government’s interest rate cap policy has also limited growth, stemming the availability of capital for small and medium-sized enterprises. Exports surged in January, growing at double the pace of the previous month. Renewed political stability has helped mend business sentiment, vaulting the Stanbic Bank PMI to a 26-month high in March. A unity deal between President Uhuru Kenyatta and opposition leader Raila Odinga in February is helping enable the economic revival, pushing the shilling up against the dollar to a nearly three-year high on 20 April. Although the economy appears to have picked up steam, weak private sector credit growth due to the cap on commercial bank lending rates continues to restrain momentum, while concerns over the country’s mounting debt burden have delayed a USD 3.5 billion road project. Against the backdrop of increased political stability, the economy should be buoyed this year by higher agricultural output amid more favorable weather conditions, an upturn in construction activity for planned infrastructure projects, and an expansion in investment. While President Kenyatta has announced that the interest rate cap could be modified or scrapped, the timing is still unclear. FocusEconomics analysts project GDP growing 5.5% in 2018, which is up 0.2 percentage points from last month’s forecast, and 5.8% in 2019. Preliminary data revealed that price pressures continued to soften in March, with inflation falling to the lowest level in nearly two years. Regional inflation came in at 10.5%, down from February’s 11.0% reading. Lower price pressures were observed in most economies, including Nigeria and South Africa. Greater exchange rate stability and the fading impact of past droughts has helped calm regional inflation. While overall inflation is ebbing across the region, price pressures remain high in certain economies, preventing central banks from cutting rates. Policymakers in Angola and Nigeria held interest rates at high levels in recent weeks amid elevated inflation. In contrast, the central banks of Ghana and South Africa cut rates in March on the back of improved inflation outlooks. The Consensus Forecast for regional inflation was cut for a second consecutive month this publication, and inflation is seen averaging 10.3% in 2018, down 0.3 percentage points from last month’s forecast. Eight economies saw their inflation projections lowered, including Angola, Ghana and Nigeria. In 2019, our panel expects regional inflation to recede and average 9.1%.